Thank you for visiting Alien Gear Holsters. The below FAQ covers questions encompasing each of our products. If you have any questions that are not answered here please contact customer service at 208-215-2046. Have a question about certain holsters? Q. What kind of Warranty is offered with Alien Gear Hosters Products? If anything on your Alien Gear Holster ever breaks, we'll repair or replace it at no cost. We've got you covered forever! With the 30-day test drive you have the opportunity to try our products and discover the most comfortable holsters on the planet. If you disagree within 30-days we'll buy it back no questions asked. With our free shell trades for life, if you get a new handgun you have the ability to exchange your old shell for a new one. Due to the advanced nature of the ShapeShift System, the Shift Shells are not covered by this offer. Q. Is my holster shell exchangeable? Revolver shells and Semi-auto shells are not on the same interchangable hole pattern. Although all handguns sizes (except revolvers) of our IWB holster bases will fit each semi-auto shell, there is a size best suited for each handgun. For more information please visit our shell swaps page or give our customer service a call. Q. Can I upgrade my current Alien Gear Holster to a new model? A. Unfortunately we are not able to offer upgrades to newer holster models. However if you are still within the 30-day Test Drive you can send your holster back for an exchange. If you have any more questions about holster exchanges please contact us, or take a peek at our holster exchanges page. A. If you would like to track your Alien Gear Holster order you'll want to register for an account upon checkout. After registering, you will have the ability to login to your account and track your order from there. If you don't setup an account however, we will send you an email when your order ships. This email will contain the tracking information required to keep an eye on your holster before it reaches your doorstep. Q. How do I prevent my holster screws from backing out? A. After you have received your holster and have customized it to your ride height and retention preference, we recommend using blue lock-tite or clear nail polish on the screws to prevent them from backing out. Q. Can I modify my holster without voiding the forever warranty? A. Some customers do modify our products to match their needs. However, we do not recommend modifying your products as then we cannot guarantee the safest fitment. **Note: Any modifications to a ShapeShift Holster will void the lifetime warranty. Q. How do I clean and maintain my holster? A. With the following products we recommend handwashing with a couple drops of dish soap followed with air drying. For our leather products (Cloak Tuck Original/Cloak Slide) we recommend saddle soap or leather cleaner. If you have more questions, check out our blog on how to maintain your holster. Q. Do I order a right or left handed holster for small of the back carry? A. Please do not wear your IWB holster at the 6 o’clock (small of back) position. This location could result in personal injury if you were to fall backwards. If you are set on carrying small of back, you would order the opposite of your strong hand. But be advised that this carry preference may result in flagging yourself while drawing. Q. How does the Free Shipping work? A. Alien Gear Holsters offers free shipping in certain circumstances. Specifically, shipping is free on any order over $100 in base price, such as the ShapeShift Core Carry Pack or ShapeShift Shoulder Holster but will also work with any combination of Items that equals $100 or more before shipping and handling and/or tax. Q. What does "any orders over $100" mean? What about any discounts? A. We do offer some discounts (2 Holster Combo and bundling discounts) that can subtract from the total of your order. Free shipping applies to any order of more than $100 after any discounts have been applied. In other words, the $100 threshold is for the final price of the order. Q. Does the free shipping take longer? A. Not at all! It's our standard shipping, which is 5 to 8 business days on average after we hand build your products(s) to order. The difference is that we don't charge you for shipping if the final total for your order is more than $100. Q. Do I still have to pay for expedited shipping? A. If you are needing your product faster than the 5-8 business days our standard shipping offers, you may want to consider taking advantage of one of our premium expedited shipping options. Unfortunately, we cannot offer free expedited shipping as we are still just a small American company. Q. What if I get free shipping and have to send some items back? A. We do hope that your holsters and other products are to your satisfaction. However, you will have to pay for return shipping. If you feel that your circumstances merit a different arrangement, you will have to contact our Customer Service Department to see if your circumstances warrant us doing so. They can be reached at 208-215-2046 or by using the email form on our website located on our Contact Us page. Q. The ShapeShift line is not available for my gun. What's next? A. We plan to keep adding firearms to our new ShapeShift Modular Holster System! The next wave of Shift Shells will be released in approximately 60-90 days! Our intention is to eventually release new compatible firearms every week. If you subscribe to our newsletter on our website, we will keep you updated with all the newest products we offer. Q. What is the ShapeShift Holster made out of? A. Wondering what makes the ShapeShift the next evolution in concealed carry. The ShapeShift Modular holster is made with a proprietary blend of polymer to enhance durability and ensure that your holster serves you and your gun for a lifetime. By utilizing polymers that are similar to the ones used in production of firearms we ensure that the holster will last through hot weather unlike many other holster options which may deform in such conditions. And in case anything does happen to your holster we back every product with a life-time warranty. Q. What guns are available for the ShapeShift? A. The following guns are now available for the ShapeShift Modular Holster System. For the most up-to-date guns list, please visit the Core Carry Pack page and view the guns in the dropdown box. If you are unable to find your firearm on this list or on the Core Carry Pack product page, please know we are working diligently to add more handguns to this list. View the ShapeShift Release Calendar for more information. Q. What improvements have been made from previous Alien Gear Holsters? The ShapeShift 4.0 IWB Holster is designed with an all-new perforated neoprene and a flexible steel core, which offers enhanced comfort and improved flexibility. The new IWB holster also sports a pair of adjustable holster clips, so you can adjust your holster’s cant and ride height with zero tools! To achieve the next level of concealment, the ShapeShift IWB Holster is designed with the slim Shift Shell. You asked for it, and we listened! The brand new ShapeShift Appendix Carry Holster allows you to conceal safely and comfortably all day long. With its versatile design, you can wear this holster anywhere on your waistband. The ShapeShift OWB Paddle Holster is now designed with 360-degree cant rotation, allowing you to choose your preferred carry angle. This innovative paddle holster also includes a removable thumb release. Additionally, this improved OWB Paddle Holster is fully compatible with the ShapeShift Holster mount, which allows you to attach your holstered handgun to a variety of surfaces. With its slim design and upgraded CoolVent Neoprene backer, the all-new OWB Slide Holster is far more concealable and will conform to your side in seconds. This holster is the most comfortable, concealable OWB holster on the planet. Period. Q. Will my other Alien Gear Holsters work with the ShapeShift Expansion Packs? A. A Shift Shell is designed to work with all of the ShapeShift Modular Holsters. If you have a Shift Shell it will work across the board. Unfortunately our Cloak series holsters will not work with ShapeShift Expansion Packs with the exception of the Cloak Mod. The Cloak Mod is compatible with the ShapeShift Drop Leg Expansion and the ShapeShift Molle Expansion packs. Q. How do I put together my ShapeShift holster? A. Once you play around with your ShapeShift Holster a bit, it's easy enough to assemble. If you need help getting started check out this video. Q. Which ShapeShift Holsters does the thumb release work with? Q. Are there any discounts with the ShapeShift? A. Absolutely! The ShapeShift Shoulder Carry Expansion Pack is $10 off with purchase of a Shift Shell or additional holster, and all other ShapeShift Carry Expansions are 20% off with the purchase of a Shift Shell or full ShapeShift Holster. Click the image to view product questions. Q. 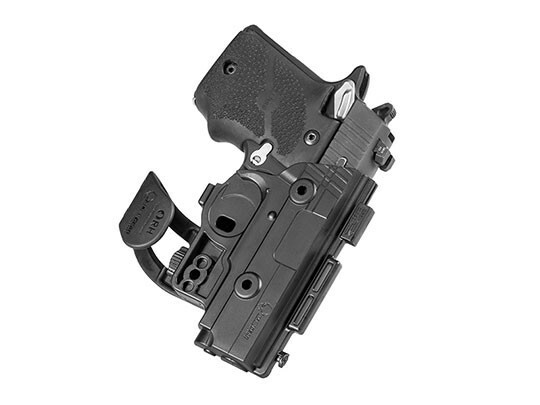 Which configurations does the holster mount work with? A. The holster mount requires a full shell configuration. With the tool-less design of the ShapeShift System it is easy enough to swap over. However, if you do not wish to disassemble your half-shell holster we recommend purchasing another Shift Shell for use with the holster mount. Q. What is included in my ShapeShift Core Carry Pack order? Q. Is the 4.0 IWB Holster sweat resistant? A. Absolutely with our patented Coolvent neoprene the ShapeShift 4.0 IWB is completely sweat resistant and breathable. Q. What is the difference between the 3.0 and 4.0? A. The 4.0 IWB holster is a tool-less variant that is now edge-bound and uses only one mounting point for improved comfort. If you would like to know more about the difference between the Cloak tuck 3.0 and 4.0 we wrote a blog comparing the 3.0 IWB holster vs the 4.0 IWB holster. Q. What is included in my 4.0 IWB order? Q. Where on the waist-line can you carry the AIWB holster? A. The Shape Shift Appendix Carry was designed for 1 o'clock carry, but really it works great anywhere on the waist-line. Carry the way you prefer! Q.What is included in my ShapeShift AIWB Holster Order? Q. Is the ShapeShift OWB Slide Holster concealable? A. Definitely! The ShapeShift OWB Slide Holster was made to eliminate bulk and hug the body tightly. This makes for easy concealment with attire such as a jacket. Q. What comes with a ShapeShift OWB Slide order? Q. What comes with a ShapeShift Paddle Holster order? Q. Is the Drop Leg Holster Adjustable? A. Yes. The comfortable straps are all adjustable, so you can achieve the perfect fit and ride height on your leg. The user guide will walk you through the fitting process. Q. Where do I wear my ShapeShift Drop Leg Holster? A. The ShapeShift Drop leg holster should be worn on the outside of the thigh at a height that your hand can comfortably grab the firearms grip. Q. Will my ShapeShift Drop Leg Holster work with any holster other than the ShapeShift? A. Yes! With the ShapeShift Drop Leg Holster's design, we were able to attach the Cloak Mod Paddle Holster. As a result, you can carry any gun we offer in a Drop Leg configuration. Q. Is my ShapeShift Drop Leg Holster concealable? A. Traditionally, Drop Leg holsters are not concealable and are used more for open carry. Q. What comes with the ShapeShift Drop Leg Holster? Q. What size straps will the ShapeShift Backpack fit? A. Most standard sized straps up to 3.5” should work with the Backpack Adapter. Q. Will it attach to more than just a backpack? A. You bet! You can attach this holster to a variety of straps including backpacks and duffle bags. Just be sure that it is safe and secure. A. With an adjustable retention unit and a thumb release, this holster is classified as a level 2 holster. Both retention devices are completely customizable and removable. Q. What comes with the ShapeShift Backpack Holster? X2 Flat Head Screws 8-32 1/2"
X2 Flat Head Screws 8-32 3/8"
Q. What does MOLLE stand for? Q. What products will my Alien Gear MOLLE Adapter work with? Q. How wide are the prongs on the various MOLLE Holsters? A. The two MOLLE prongs are 3.5” long X 1.125” wide and should fit any standard PALS webbing. Q. Is the MOLLE Holster compatible with PALS or ALICE? A. The MOLLE Holster will work with any standard PALS webbing. However, it is not compatible with the now antiquated ALICE clips. Q. What is the reason for the 1.5” MOLLE Lock-Extended vs the .5” MOLLE Lock-Regular? Q. Where can I find PALS webbing? What is it used on? A. The Pouch Attachment Ladder System or PALS is a grid of webbing invented and patented by United States Army Natick Soldier Research, Development and Engineering Center. It is used to attach smaller equipment onto load-bearing platforms, such as vests and backpacks. Q. What are some of the benefits to the MOLLE Holster? A. Some tactical equipment such as vests, battle belts and backpacks utilize PALS webbing intended for use with MOLLE attachments. Standard civilian tactical gear may not have sufficient compatibility with the PALS interface. The ShapeShift MOLLE Holster and MOLLE Adapter bridges the gap between civilian and military application. Q. What does the MOLLE Holster come with? X6 Flat Head Screw 8-32 1/2"
X3 Button Head Screw 8-32 3/8"
Q. Are There Shoes That Will Not Work With The ShapeShift Ankle Holster? A. The ShapeShift Ankle Holster was designed to work with most mainstream shoes and “open-mouthed” boots. Narrow boots will not work with this holster; it requires room between your leg and the boot’s interior. You may need to loosen the laces to get the desired level of comfort and concealment. This holster may not work with footwear that extends up past the calf. Q. When Will I Receive my ShapeShift Ankle Holster? A. If you pre-ordered your ShapeShift Ankle Holster, orders will start shipping in early February 2018. Please note this timeframe is an approximation and may change due to order volume. We appreciate your patience! Q. Is the ShapeShift Ankle Holster Sweat Resistant? A. Yes. Our upgraded CoolVent™ neoprene helps prevent body moisture from reaching you pistol, and improves your modular holster’s breathability. NOTE: Moisture and weather elements may have access to your pistol in this carry position. Frequent and thorough cleaning of your firearm is recommended regardless of carry position. Q. Should I Order a Right or Left-handed ShapeShift Ankle Holster? A. This ankle holster is designed to be worn on the inside of your ankle. A right-handed carrier should wear their ankle holster on the inside of their left leg, and a left-handed carrier should wear their ankle holster on their right leg. This position will allow the carrier to cross draw using their dominant hand. Q. What sizes is the ShapeShift Ankle Holster available in? A. This ShapeShift Ankle Holster is made with a one-size-fits-most design. The breathable neoprene straps are adjustable to meet your personal comfort and carry needs. Q. What does the ShapeShift Shoulder holster cost? 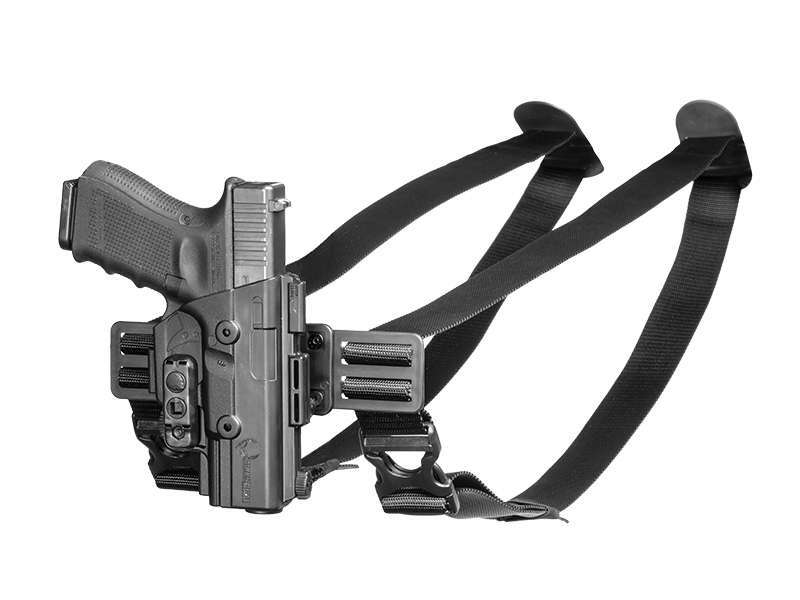 A.The ShapeShift Shoulder Holster is available for $133.88, which includes two magazine buckets. If you already have a Shift Shell™, the ShapeShift Shoulder Holster is also available as an expansion pack. The expansion pack, which includes two magazine buckets, can be purchased for $99.88. Additional platforms are available to add diversity to your carry: the gun platform with a Shift Shell is $49.88 and the gun platform without the Shift Shell is available for $27.88. Q. What size is the ShapeShift Shoulder Holster available in? A.This ShapeShift Shoulder Holster is a one-size-fits-most design. The material it is made from is light and durable; the upper and lower strap elastic adds flexibility to ensure a full range of motion. You can adjust it to meet your personal comfort and carry needs. Where other shoulder holsters focus on chest and torso measurements to achieve a good fit, we have also focused on adjustability. The straps of the shoulder holster are mounted on a swivel plate, which will accommodate almost any chest measurement. The straps themselves will have adjustments to ensure proper fit. Additionally, the belt hooks are fully adjustable to ensure the holster rides closely to the body and remains stable. Q. The ShapeShift Shoulder Holster is not available for my gun. What’s next? Q. When will I receive my ShapeShift Shoulder Holster? A.The lead time for the Shoulder Holster can be found at the top of the Shoulder Holster page. Please note these time frames are an approximation and may change due to order volume . Q. Can I track my ShapeShift Shoulder Holster order? A.You sure can if you create an account prior to purchase! When your order is placed, you will receive a confirmation email with an estimated lead time to hand build your order, and you will also receive a second email with a USPS tracking number when the order is shipped. Q. Is the ShapeShift Shoulder Holster and Expansions covered by a warranty? A.You bet! Once you have registered your warranty on our website, you can rest assured knowing your ShapeShift is backed for life. If you purchased on our website, you are automatically registered based on the information you supplied to us at checkout. The ShapeShift Shoulder Holster is fully backed by a Forever Warranty and a 30-Day Test Drive. If you are not completely satisfied by your Shoulder Holster, send it back within 30 days for a hassle-free refund or exchange. Q. Are the Shift Shells swappable and do they qualify for Alien Gears' shell swap program? A.Any Shift Shell™ will work with the ShapeShift Shoulder Holster, so you can swap out your Shift Shell with any other Shift Shell you own. NOTE: Some adjustment may be required when “shifting” from one firearm to another for optimal comfort and concealability. Our shell swap program only pertains to our hand-pressed Cloak Series shells. Due to the advanced nature of the Shift Shells, the ShapeShift Modular Holster System is not part of the shell swap program. Q. Can I upgrade from my current Alien Gear Holster? A.The ShapeShift marks a new age of concealed carry holsters, therefore we are not able to offer an upgrade from previous holster models. However, you can send in your holster for an exchange if you are still within the 30-Day Test Drive, and we will be happy to take care of you. Some additional costs may apply. If you have any questions about exchanges, please contact the Customer Service mothership at (208) 215-2046 or email us at support@aliengearholsters.com. Q. What draw hand should I order the Shoulder Holster for? 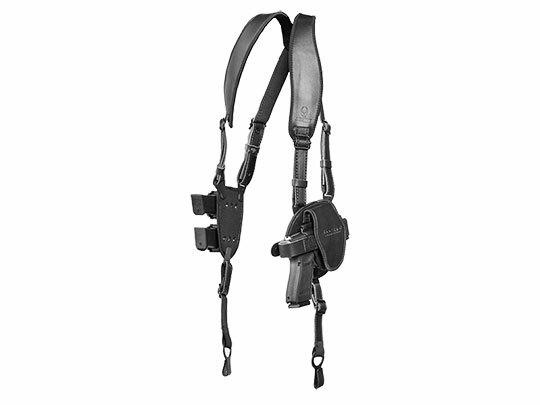 A.This Shoulder Holster is designed to be worn with your firearm offside and drawn cross draw as is customary with most standard shoulder holsters. A right-handed shoulder holster should be worn under the left arm and a left-handed shoulder holster should be worn underneath the right arm so that the pistol can be drawn with the “strong” hand. The firearm should sit high under the arm. Q. Is the ShapeShift Shoulder Holster sweat resistant? A.Yes. The updated CoolVent™ neoprene helps to prevent perspiration from reaching your pistol and improves your shoulder holster’s breathability. NOTE: Moisture and other elements from your environment, such as weather conditions, may have more access to your pistol in this carry position if not worn under a weatherproof coat or jacket. Frequent and thorough cleaning of your firearm and holster is recommended regardless of carry position. Q. Can I adjust the cant of my firearm with the ShapeShift Shoulder Holster? A.Absolutely! The Shoulder Holster will have several ways to cant your firearm to your optimal draw. 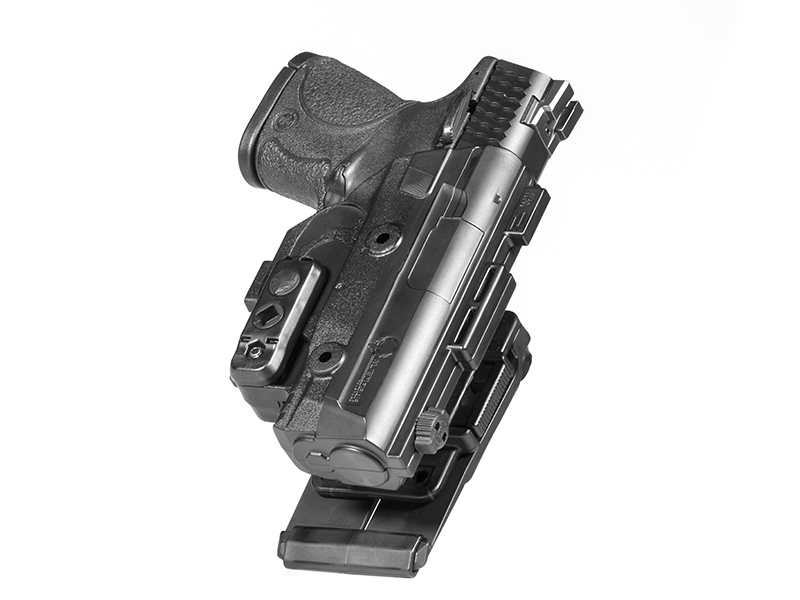 The Holster Platform has additional places for the platform connectors to add forward or reverse cants to the Shift Shell™. Additionally, the Shift Shell’s holster connector can be altered from the default neutral cant to forward or reverse. Q. Can I dual carry with the ShapeShift Shoulder Holster? A.Sure! Our offerings include several configurations, including options to carry two firearms or up to four Cloak Mag Carrier buckets. With interchangeable platforms, you will be able to customize to suit your carry preferences. The ShapeShift Shoulder Holster will have your choice of Shift Shell and two mag buckets. You also have the option of purchasing just the shoulder holster gun platform. Q. What retention levels does the ShapeShift Shoulder offer? 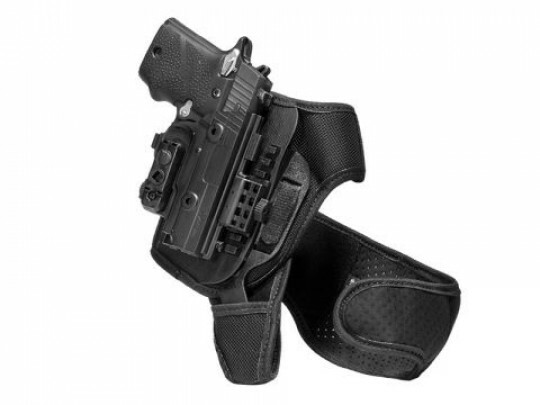 A.This holster will have the option to carry from a Level I retention up to a Level III with the optional items included in the Shoulder Holster. This includes the Adjustable Retention Unit on the Shift Shell as the passive retention device, the optional thumb break with directional snap and\or the thumb release on the Shift Shell™. Q. What will my ShapeShift Shoulder Holster come with? A.The ShapeShift Shoulder Holster will come with the assembled shoulder straps, a complete Shift Shell, mag carrier platform and the strap link in case you do not wish to utilize the mag buckets. Additionally, you will receive a how-to guide and a spare parts pack. The ShapeShift Shoulder Holster Expansion Pack will arrive with the above items, minus the Shift Shell itself. We will also offer additional gun platforms for $49.88 that will include the Shift Shell, or just the platform without the Shift Shell for $27.88. Q. How does this holster attach to my seat? A. This easy installation process requires zero drilling or mounting hardware. To equip your vehicle with the Driver Defense Holster, simply thread the adjustable straps through the opening between your seat and seatback, then buckle the straps together underneath your seat. For detailed installation instructions, we include a comprehensive user guide with each order. Q. Will the Driver Defense Holster work with my gun? A. For a complete list of compatible gun models, check out our "Search by Gun" page. If your gun is not currently available for the ShapeShift Modular Holster System, the Cloak Mod OWB Holster is available for over 500 firearms, which can attach it to the Cloak Mod Car Adapter. 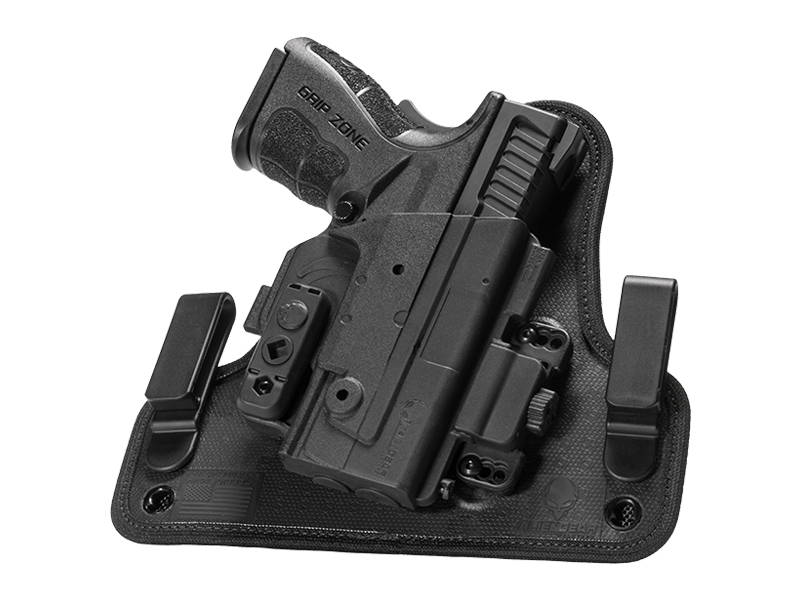 Q. What’s the difference between this holster and the ShapeShift Holster Mount? A. The Driver Defense Holster is specifically designed to strap securely to your seat, while the ShapeShift Holster Mount attaches to a variety of surfaces including plastic, wood, sheet metal and drywall. Choosing between the two comes down to the location you’d like to secure your handgun. The Driver Defense Holster is also a less permanent way to secure your firearm in your vehicle. You can remove the entire unit by unbuckling the straps and pulling them through your seat. Q. Will this holster fit my car’s seat? A. With its adjustable design, the Driver Defense Holster should accommodate most vehicle seats as long as there is a slot between the top and bottom section of the seat. We have provided a pair of 6’ nylon straps to accommodate most seat sizes and styles. If this holster does not fit your seat, sent it back within the first 30 days for a hassle-free refund. Q. What do you mean when you say this will work with most car seats? A. Most vehicle seats have an opening where the back rest meets the seat and an opening underneath the seat. The design of the Driver Defense Holster was based off this design, but there are just too many seat models to say that our holster fits them all. Q. Does this holster work with office chairs? A. With its adjustable design, the ShapeShift Driver Defense Holster is compatible with more than just vehicle seats. As long as there is a slot between the top and bottom portion of your seat and room to thread straps underneath, you should be able to equip this holster to a variety of seats. Q. Is this holster compatible with the Cloak Series? A. Yes! We offer a car adapter for the Cloak Mod OWB Holster. Q. Is this holster covered by a warranty? A. You bet. The Driver Defense is fully backed by our 30-day test drive and Forever Warranty. Q. Does this work with my Shift Shell? A. Yes. This expansion pack is fully compatible with the Shift Shell and the entire ShapeShift Modular Holster System. Q. Will this expansion pack fit my seat? A. Great question! We’ve designed this product with 6’ adjustable straps, so it should fit most vehicle seats and office chairs. The straps will need to go through the slot between the upper and lower part of your seat, so be sure to check that your seat has this slot before ordering your expansion pack. The straps will also need to thread underneath your seat, so ensure there is space to pull a pair of straps through. Q. Can I send it back if it’s not the right fit? A. You sure can! If this expansion pack does not work with your seat, send it back within the first 30 days for a refund. Q. Is this ShapeShift expansion pack covered by a warranty? A. If your Driver Defense Expansion Pack breaks for any reason, we’ll repair or replace it for free. Q: Where should I NOT keep my pocket holster? A: Our Pocket Holster is optimal for use in the front pants pocket. Please note your firearm and holster should never be stored somewhere loose or where it can move around freely. Make sure the pocket you put it in is secure and in a place that it is the only item in the pocket. Q: Won’t a pocket holster print and show my gun in my pocket? A: Our Pocket Holsters were crafted with a patent-pending pocket hook designed to disguise the look of your firearm in your pocket as well as preventing the holster from detaching from your pocket when you draw. Q: How big is this holster? Will it actually fit in my pocket? A: It depends on the size of your gun as well as the size of your pocket. If your pants pocket is too small, there is always the option of storing it in a jacket pocket. This is the slimmest holster we have released so far, however, the size of the holster will depend on the size of your gun. The pocket hook is universal on each holster, and the dimensions for that are 1.73” tall, 1.93” wide, and 1.05” thick. Q: What makes this holster safer than typical pocket carry? A: It’s not safe to carry your handgun in your pocket if you don’t have a holster because there is a possibility that something will compress the trigger. If your firearm is in our Pocket Holster, the trigger is guarded on both sides by ultra-strength premium polymer that will protect it from any pressure. Q: Does this holster have adjustable retention? A: Yes, it does! Just like the rest of the ShapeShift Modular Holster System, the Pocket Holster includes tool-free adjustable passive retention. Just use the twist locks to fine-tune the retention to suit your draw. Q: What makes this different from a typical pocket holster? A: Commonly, pocket holsters are made of leather or other soft materials and leave the trigger unprotected—or protected by only a layer of cloth. The ShapeShift Pocket Holster is crafted out of premium polymer, the same material some guns are made of. The trigger is protected on both sides by the premium polymer. On top of all that, this holster features adjustable passive retention and a pocket hook that prevents the holster from detaching from your pocket when you draw. Q: How large of a firearm can I carry with this Pocket Holster? A: Technically, any firearm that is available with our ShapeShift line can be used with this holster, but we recommend micro/sub-compacts that take up less space and conceal comfortably. Q: How do I reholster my weapon once I’ve drawn it out of the holster? A: Just take the holster out of your pocket and carefully slide your handgun back into the Shift Shell. Do not reholster your firearm while the holster is still in your pocket. Q: Will my current holster work with this? A: If you already have a ShapeShift holster, the Shift Shell from that holster is fully compatible with the Pocket Carry Expansion Pack. Our Cloak Series holsters are not compatible with the ShapeShift Pocket Holster. Q: My gun isn’t available for the ShapeShift Series. What’s next? A: Our Cloak Series is compatible with nearly 600 firearms. Unfortunately, there is no Cloak Series option for the Pocket Holster. But don’t worry! We’re adding more guns to our ShapeShift line all the time. Keep up to date with what guns are going to be added soon with the ShapeShift Release Calendar. Q: What if I buy this holster and realize it’s not for me? A: All of our holsters come with a 30-day Test Drive. You have 30 days to return this holster for a refund or exchange for a different holster if it turns out that it’s not the right holster for you. This American-made holster is also fully covered by our Forever Warranty. Q: How many Landing Pads come with the holster? A: Three Landing Pads (the “loop” base) are included with the holster and the expansion pack, which gives you the ability to transfer your holster from place to place. But if you need additional mounting pads, you can purchase them individually here. Q: How do I maintain the hook and loop surfaces of my holster? A: It is important to keep the “hook” surface of your holster as free of lint and debris as possible to ensure a successful bond between the hook and loop surfaces when pressed together. Q: Is the VELCRO® brand hook and loop going to wear down and stop working? A: We’ve tested the VELCRO® brand fasteners through thousands of holster removals, but in case anything happens, the holster base is covered by our Forever Warranty. Q: Where should I NOT mount my Hook & Loop Holster? Q: Why isn’t my Landing Pad sticking to the surface I have selected? A: There are substances, like popular upholstery cleaning or shining agents, that may affect the Landing Pads’ adhesive ability. Any oil or wax-based agents that have been applied to the prospective surface may compromise the adhesive abilities of the Landing Pad. Q: My gun isn’t available for the ShapeShift series. Do I have any other options? A: Definitely! We’re adding more guns to our ShapeShift line all the time, but in the meantime, you might have better luck with the Cloak Series. The Cloak Series is compatible with nearly 600 types of handguns. See if your gun is on our Gun List. You can also check out future ShapeShift offerings on our ShapeShift Release Calendar. Q: Can I reuse or move the Landing Pad once it’s mounted? A: It’s not recommended to try removing or reusing the mounting pad once it’s mounted, as the adhesive may become compromised. Q: Will the Landing Pads cause damage to the surface I put them on? A: Depending on the material you attach the Landing Pads to, there is a chance that the industrial-strength adhesive will cause damage upon removal, as is the case with nearly all adhesives. After the adhesive has cured (24 hours after application) the Landing Pad will be very difficult to remove and/or reposition. Please heavily consider where the Landing Pad is placed before adhering it to the surface. Surfaces affected or blemished by the adhesive pad will not be covered by the holster's warranty. Q: Can I draw my firearm from this holster when it’s mounted to a surface? A: If it’s placed somewhere at a good enough angle for you to reach for your weapon safely with a full firing grip, you can absolutely draw your handgun from the holster while it’s mounted. As with any draw position, be sure that your finger is not on the trigger. It’s good to practice drawing from your holsters to form muscle memory—it’s helpful to not have to think about the motion if there’s an emergency. Q: What if I receive this holster and realize it’s not for me? 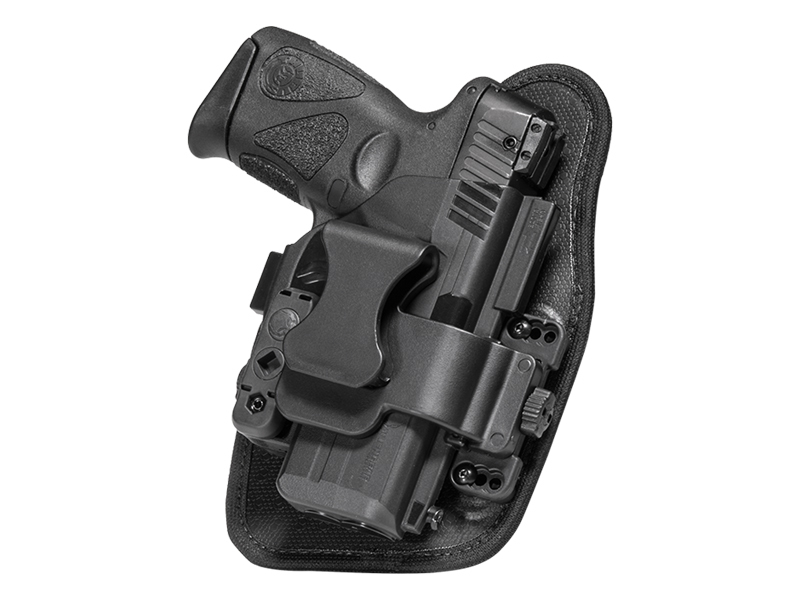 A: All of our holsters, including this one, come with a 30-day Test Drive. You have 30 days to return this holster for a refund if you decide it isn’t for you. Q. 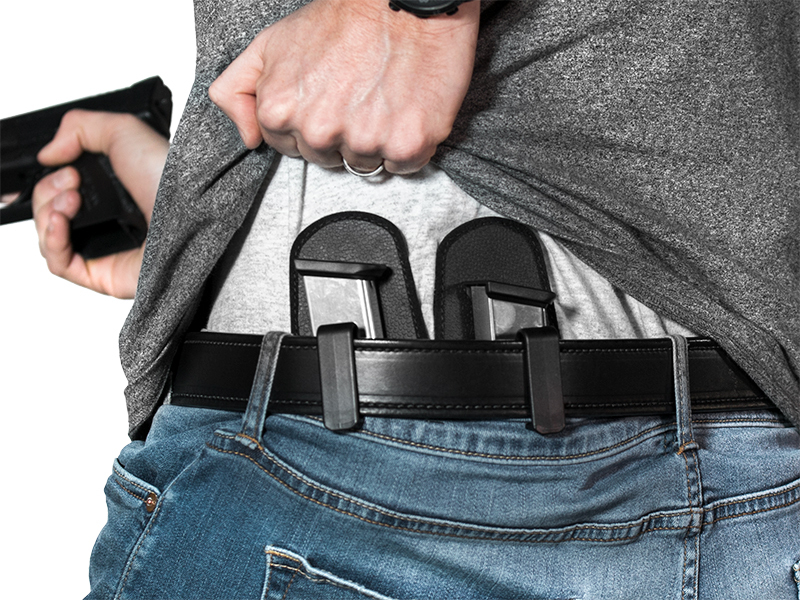 What level of retention do the Cloak Series holsters come in? A. The Cloak Series holsters all come with our adjustable retention to fit your preference. Unfortunately we do not offer active retention for these models. All Cloak Series holsters are level 1 retention. If you need a level 2 holster the ShapeShift line-up offers multiple level 2 retention holsters with our thumb-release technology. Q. What color options are available? A. Our leather products (The Cloak Tuck Original and Cloak Slide) are offered in black and brown. And our other Cloak Series holsters come in black. Q. Are the Cloak Series shells interchangeable? A. With our universal hole patterns you can easily swap holster shells on your base. However keep in mind that semi-automatic handguns and revolvers do utilized different hole patterns so they are not interchange-able. The best fit will be located right below the drop down after selecting a firearm. Q. How is the Cloak Tuck leather treated? A. The Cloak Tuck IWB Holster is made with only the finest vegetable tanned, English bridle leather. Q. How does the Cloak Tuck original compare to the Cloak Tuck 3.0? A. The Cloak Tuck is a classic design of carry holster, for those who prefer a tried-and-true holster design. The 12-ounce leather backer is plush for great comfort but strong enough to last through a lifetime of service. The Cloak Tuck 3.0, however, uses a multi-layered holster base design for a more modern approach to concealed carry gear, though this comes at the cost of a thicker holster base. Q. What is the break-in time of the Cloak Tuck Original? A. The Cloak Tuck Original break-in time is roughly 2 weeks. Q. Is the holster cant adjustable? A. Absolutely! The OWB slide is crafted to ride close to the body offering security and concealability. Just drape a jacket over your Cloak Slide and you are good to go! Q. Are leather loops the only option? A. The Cloak Slide OWB Holster features adjustable leather loops. Unlike many other OWB holsters, which are often stitch-reinforced holes in a leather holster, the Cloak Slide's leather loops can be tightened or loosened as the user desires, further enhancing the security of carry. Q. What materials are the Cloak Mod OWB Paddle Holster made of? A. The Cloak Mod OWB Holster has been built to withstand a lifetime of continued use. Its tenacious design begins with an all-new stainless steel flex plate, which provides the paddle holster with a great deal of strength and fortitude. The retention membrane, made of thermo elastomer, covers the flex plate and provides the Cloak Mod with more grip and retention. Its soft surface also protects your gun from damage and wear. The curved paddle attachment is made of tough polypropylene and the rigid backer is made of nylon; two materials that will hold up to decades of hard use. The Cloak Mod’s retention shell covers your sidearm and also provides carriers with a means to adjust the retention to their gun. Simply tighten or loosen the shell’s screws to customize your retention. The thick OWB shell can also be swapped out in order to match the gun that you would like to carry. Q. How Should the Cloak Mod OWB Paddle Holster Be Carried? A. The Cloak Mod OWB Holster can be worn at any position along the waistline, but most will chose to carry at the 3 o’clock position. It’s all up to you. Q. Is the Holster Adjustable for Cross-draw 9 o’clock Carry? A. Yes. For instructions on how you customize your Cloak Mod follow the directions provided on our How-to page. Q. What is in the Parts Pack for the Cloak Mod? Q. What Are the Benefits of Using the Belt Slide Attachment? A. 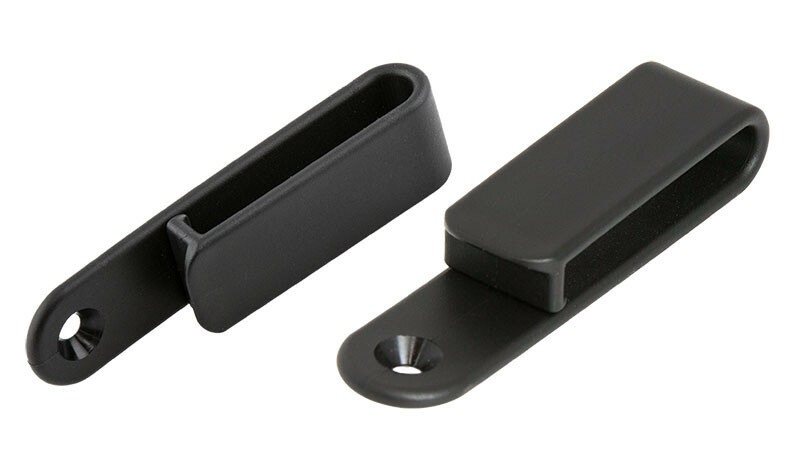 If you’re looking for superior security, the slide attachment is your tool. Although the paddle itself comes complete with a secure retention lip, you may feel more comfortable by switching your paddle to the slide. Q. What is the difference between the Rigid and Comfort belt slide attachments? A. The difference between the Rigid and Comfort slide attachments is rigidity. The Rigid Slide Attachment stays flat and secure while the Comfort Slide Attachment offers bend to form best to your waistline. Choose which one you prefer before adding the Cloak Mod to your cart. Q. What if I want the paddle and the slide carries? A. The Cloak Mod comes with the paddle and your choice of slide attachment. If you would like both slide attachments you can find them on with our holster gear. Q. Does the Cloak Mod OWB Holster Come in Tan? A. To keep things sleek and tactical, we offer the Cloak Mod exclusively in black. Q. What Keeps The Holster From Riding Up (especially when drawing)? A. The retention lip on the inside of the paddle prevents the holster from moving around on you. Combined with a quality gun belt, the force of drawing will be distributed to your belt, which prevents the paddle holster from riding up. Q. What are the Pros and Cons of OWB and Paddle Holsters? A. The Paddle Holster is fast, effective and easy to use. It’s the type of gun holster you grab on your way out of the house and quickly slide inside your waistline. 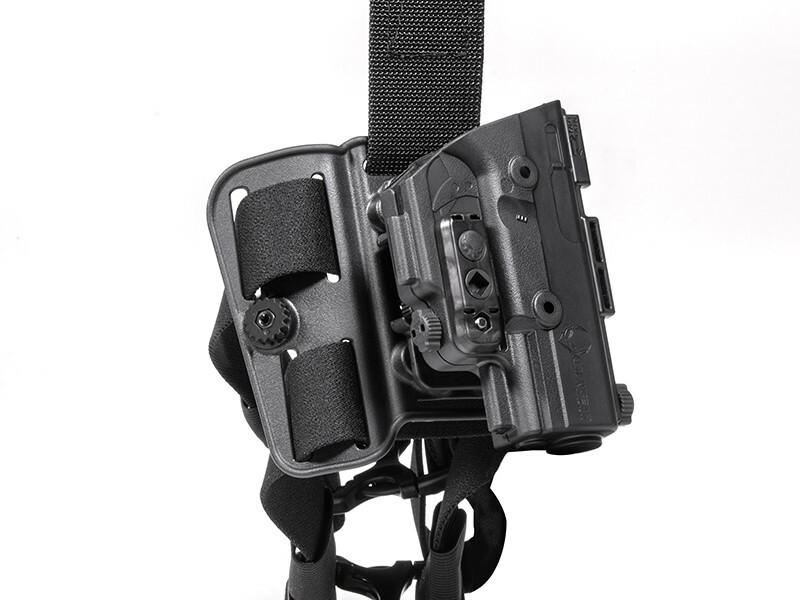 In the same regard, this OWB holster is capable of being even more secure if you choose to wear it using the slide attachment provided in the parts pack. Q. If You Only Wear a Belt on Occasion, is the Paddle Holster a Good Fit? A. We recommend that the Paddle Holster be worn with a proper gun belt to give your firearm the security and stability it requires. Q. What makes this mag carrier so special? A. Our Cloak Mag carrier is crafted to offer the best mag carrier features available! Designed with what looks like Alien technology, the Cloak Mag Carrier is capable of being worn openly (OWB) or concealed (IWB). It also offers customizable retention and 360 positioning to those looking to personalize their carry. Q. What’s included in my Cloak Mag Carrier order? Q. Will this magazine holster fit my mag? Q. Do you have a double magazine holster? A. We do indeed! Purchase the Double Cloak Mag Carrier and you'll have the ability to open or conceal carry two magazines at a time! Q. Are There any discounts associated with these mag carriers? A. Yes! Bundle either the single or double mag carrier with any holster we offer and save $6 off your order! Q. Is this mag carrier adjustable? A. Yes! 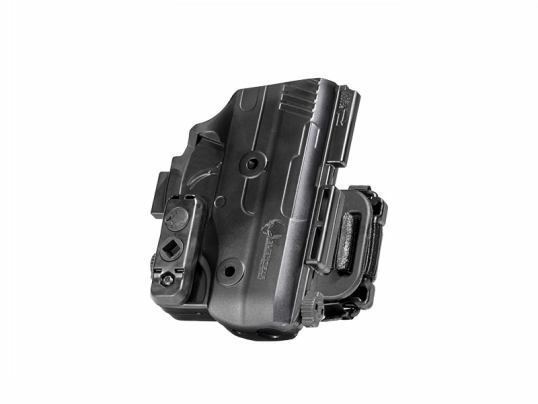 The Cloak Mag Carrier is equipped with adjustable cant (angle) and retention. It is also capable of being worn inside-the-waistband (IWB) or outside-the waistband (OWB). A. You bet. The Cloak Mag Carrier is fully water and sweat-proof. A. The Cloak Mag Carrier is made with a premium engineered polymer and includes a neoprene backer for concealed carry. Q. Can You interchange Mag Buckets with the IWB neoprene Backer? A. It depends. The .380 Auto is the smallest backer we offer. The next step up is compatible with the 9 mm and .40 caliber single stacks. And the largest backer we offer carries 10 mm and .45 double stacks. Q. Is the Cloak Mag Carrier compatible with MOLLE/PALS tactical webbing? A. We now offer an option purchase a MOLLE Adapter when you are purchasing your Alien Gear Cloak Mag system. This MOLLE Adaptor will work with all standard PALS webbing. Q. How can I wear the Double Cloak Mag Carrier? A. 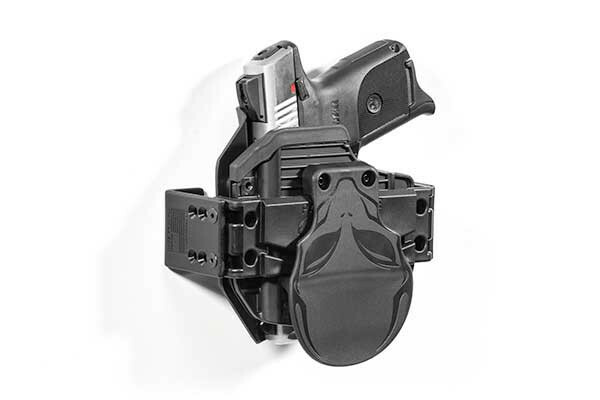 The Double Cloak Mag Carrier is capable of being worn inside-the-waistband (IWB) or outside-the-waistband (OWB). To carry OWB, every order includes a paddle and belt slide attachment. With these durable magazine holster attachments, you can open carry two spare magazines together. To carry IWB, the Double Cloak Mag Carrier includes two separate neoprene backers, allowing you to conceal carry two magazines separately. Q. What Dimensions are the magazine Buckets? A. Our magazine holster buckets range from 2.82" tall, 1.48" wide to 3.20" tall, 1.86" wide depending on your caliber and magazine thickness. Q. Which holsters can be used with the Cloak Dock IWB/OWB? A. Each Cloak Dock Holster Mount is designed exclusively for Alien Gear Holsters. The Cloak Dock can fit either the Alien Gear IWB or OWB holster. The Cloak Dock IWB will work with all of our Cloak Tuck IWB Holster Series when used with our standard nylon clips. The Cloak Dock OWB is exclusively compatible with the Cloak Mod OWB Paddle Holster when equipped with the paddle attachment. Q. What is the Cloak Dock IWB/OWB Made Of? A. Our holster mounts are made of premium engineered polymer, which is both resilient to wear and impressively durable. Q. Where Should I NOT Mount My Cloak Dock IWB/OWB? A. The Cloak Dock is designed to be mounted onto a structurally sound surface. The stronger the material, the better. Also be sure to mount the Cloak Dock in a safe and child free location. Q. What Type of Colors Are Offered? A. The Cloak Dock IWB/OWB is available exclusively in black. Q. Is the Cloak Dock IWB/OWB Customizable? A. Cloak Dock OWB: We've made it possible for you to adjust your Cloak Dock Holster Mounting System to better suit your personal preference. By flipping the center bar on your Cloak Dock, you can position your Cloak Mod Holster either shell side out or paddle side out from any given surface. This all comes down to personal preference and how you'd like to draw your gun. Secondly, the Cloak Dock is designed with custom depth positioning. 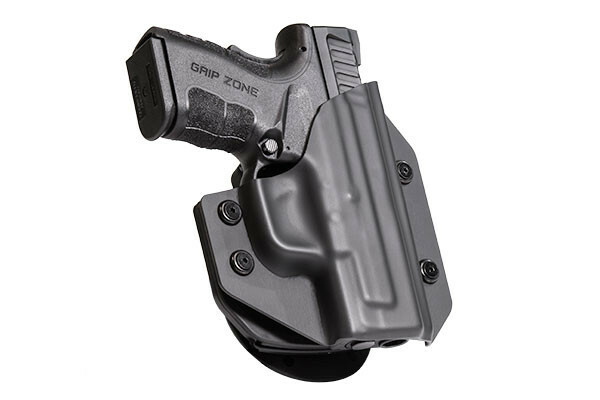 This feature allows you to position your holster and gun closer or further away from the mounting surface. For thicker guns, you may want to use the furthest out mounting option. Again, this customization comes down to your personal preference. Cloak Dock IWB: Your Cloak Dock IWB can be mounted to wood, dry wall, sheet metal and plastic. This holster accessory is also capable of accommodating your preferred ride height and cant. Please note, your holster clips must be parallel to one another. Q. Are There Any Discounts Available For The Cloak Dock IWB/OWB? A. Cloak Dock OWB: You bet! For added saving, bundle your Cloak Dock OWB with a Cloak Mod OWB Holster and save $4.88 off the price of the holster mount. 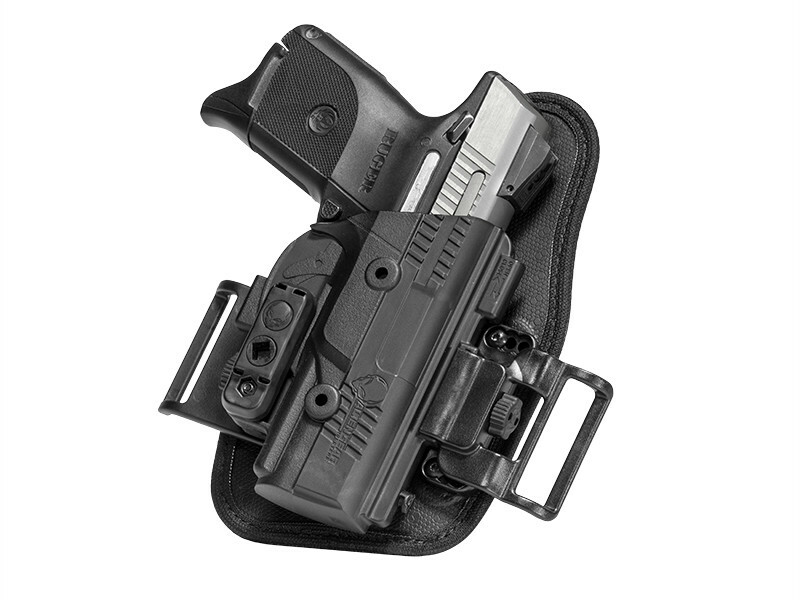 When ordered together, this holster and accessory are available for just $57.88. Cloak Dock IWB: Of course! For added saving, bundle up your Cloak Dock IWB with a Cloak Tuck IWB Holster (Original or 3.0) and save $4.00 off the price of the IWB holster mount. 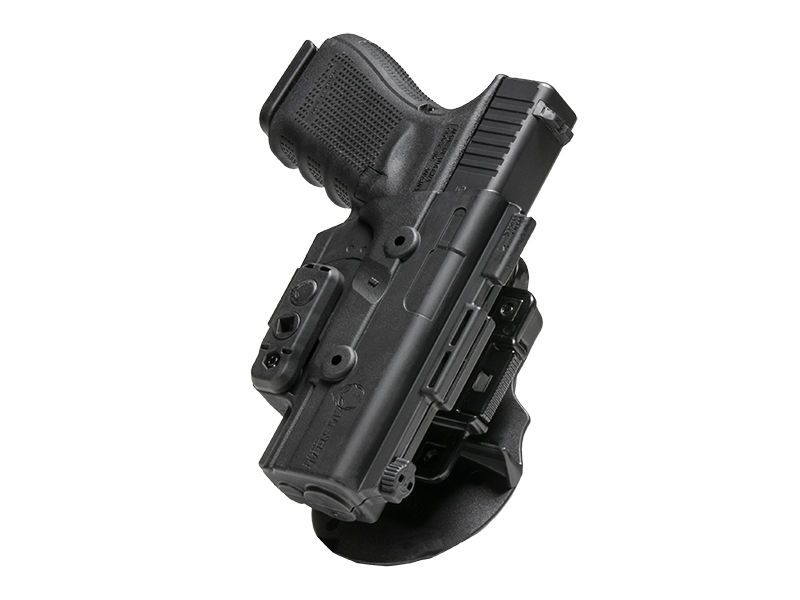 When ordered together, this holster and accessory are available for just $37.76 - $51.76. Q. What Size is the Cloak Dock IWB/OWB? A. Cloak Dock OWB: When fully assembled, this accessory is 6" long, 2.5" deep, and 1 ¾" tall. Q. Does This Discount Apply to the 2 Holster Combo Deal? A. Yes! if you add a Cloak Mod and/or Cloak Tuck as part of your 2 Holster Combo, you will receive the discount on your Cloak Dock Holster Mount. Q. Is This Discount Available For Those Who Already Own A Cloak Mod OWB or Cloak Tuck IWB Holster? A. Definitely. We would be happy to extend this discount to those who've already purchased a Cloak Mod OWB Holster or any holster within our Cloak Tuck Series. To receive these savings, please contact our customer service team at (208) 215-2046. We're available Monday - Friday 5am - 8pm PST, or Saturday - Sunday 9:30am - 6pm PST. Q. What are the benefits of nylon over steel clips? A. Our nylon clips have been engineered to last a lifetime without warping over time. This ensures that you are able to carry securely for the years to come. Q. Will my 3.0 clips work with the ShapeShift? A. No. Due to the tool-less nature of the ShapeShift modular holster system, it uses differently engineered clips in order to allow ride height customization without any hardware. Q. What are C, J, and O clips? A. C Clips are clips engineered to wrap around only the top and bottom of the belt for the perfect blend of concealability and security. J Clips catch on the bottom of the belt while minimizing the amount of visible holster clip increasing concealability. O Clips offer the highest amount of security by wrapping around the belt completely. Q. What are leather loops? A. Leather loops are similar to "O" Clips and wrap around the entire belt to increase security while carrying. A. Checking your Alien Gear Holsters gift card balance is as easy as filling in the your cards information. If you have further questions, please call (208) 215-2046. Q. What if I have a remaining balance on my card? A. Any balance left on the card cannot be refunded. However, you can apply the remaining balance towards any future holster purchases or other concealed carry gear. Q. What is the shipping time? A. Shipping time via USPS is free and can ship in as little as 2 business days - this can vary during peak holiday mail times. Q. When someone buys an Alien Gear Holster or other products with their gift card, what is the wait time? A. The wait time is the same as if you were using a regular form of payment. Q. Can I buy an Alien Gear Holster Gift Card and have you send it to someone else? A. We can ship Gift Cards to all 50 states, DC, Guam, Puerto Rico, American Samoa, Marshall Islands, Federated States of Micronesia, Palau, Northern Mariana Islands and the Virgin Islands along with Military oversea locations. 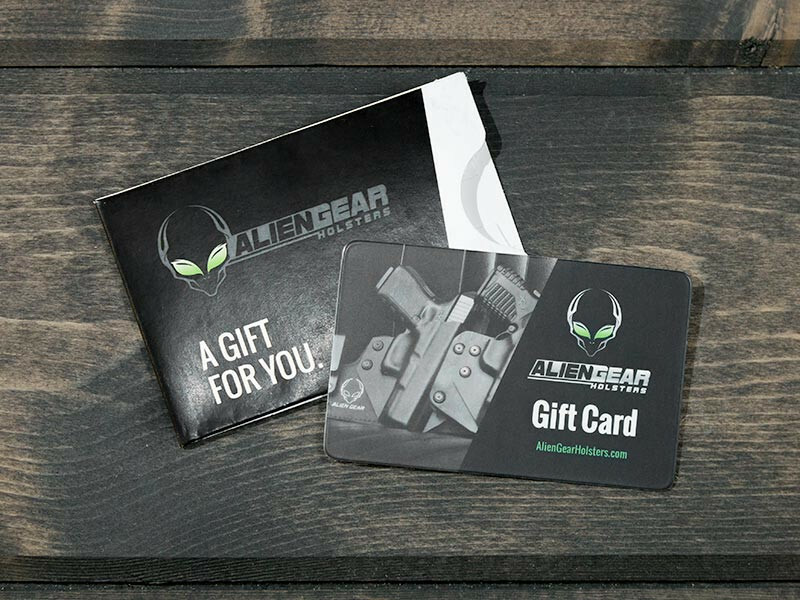 A. Alien Gear Holsters Gift Cards are not returnable and cannot be redeemed or exchanged for cash (unless required by law), check or credit. Q. Does my gift card expire? A. Your Gift Card will not expire. If several years pass without use, and the code on the back is not working, please call Alien Gear Holsters’ customer service at (208) 215-2046.